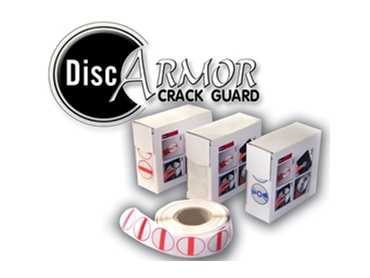 DiscARMOR Crack Guard available from Discstation Australia Pty Ltd is an innovative line of disc guards that protects discs from damage. The disc guards are ideal for public libraries, video libraries and game hire stores. Every time a disc is removed from its case without properly releasing the holding clip, it is at risk of cracking at its centre. DiscARMOR Crack Guard can be applied in seconds and functions similar to a mouthguard to protect discs from damage right through their rental life. If put up for sale, the disc guard can be easily removed to leave an undamaged surface that maximises their value. DiscARMOR Crack Guard is suitable for DVD, Blu-Ray and game discs. Made from super strong metallised polyester and backed with adhesive, DiscARMOR can withstand multiple exposures to high temperatures generated when a disc is played.